NOTES ON THE MAKING OF "NO TELLING"
FILMMAKING IS A LONG AND DIFFICULT PROCESS, and I feel ultimately that the doing of it has to make sense' and be able to undergo scrutiny and have its own value. For the product, in this world of overinformation, may well be lost into a sea of sound bites. And so for No Telling, we wanted to run the production in a way that was consistent with the environmental themes of the film itself. NOT FAR INTO PRE-PRODUCTION, we hired an environmental consultant. We were already in motion with the production, and I would recommend ^consulting with someone even earlier then we did. Our consultant made a lot of calls and was able to interest alternative vendors in supporting our project with the donation of their products. Many companies responded, and we were able to get soaps, snack foods, juices, and some personal care products from these vendors. We were very grateful for their support. "NO TELLING" WAS SHOT ON LOCATION in upstate New York in and around Callicoon Center which is near the town of Liberty in Sullivan County. We moved our cast and crew of fifty to a well-worn hotel in the area called the Four Seasons. This was where we lived and filmed for five and a half six-day weeks, and where we performed our experiment in low-impact filmmaking. INFORMATION: We handed out a lot of literature to the crew on environmental and animal rights issues. We made some animal rights videos available to the-cast and crew, videos which are-rarely seen outside the movement. The tapes inspired further discussion. Throughout the two-month process, from pre-production through filming, there, were ongoing discussions and debate between people who had not been fully exposed to the concepts before. Most importantly; in practicing the policies during the hardships of filmmaking, we supported the notion that institutions of all sizes and. kinds can incorporate ecological solutions while going about their business. FILM STOCK: We shot on Kodak's Super l6mm color 7248 daylight film. For night scenes we used 7292 and their fast film 7296 which we decided was too grainy for the look we wanted. Because we were anticipating the blowup to 35mm, we were going for a. fine grain look, and so for interiors, we, used a lot of light to get exposure on the 7248; This was not the most energy efficient shoot in terms of lighting: If you are shooting for blowup, you may not want to fight the grain as we .did. We used a Panther dolly; which was extremely versatile and got us some shots which might have required a small crane. It also saved us track laying time because it has a swivel pedestal in the middle instead of one end of the dolly. Other unusual effects we got with home made grip rigs. PAPER: We bought recycled paper in bulk, boxes of 5,000 sheets: In this quantity, the price is not much, different than first generation paper, and it is just as good. It works in the printer we had in the office. However, copy shops at the time were wary of recycled paper. The high heat used to make copies seemed to curl the paper. Much of this has changed now, only two years later. On location, all our colored paper was from recycled stock, including the pink, blue, and yellow paper that we used to indicate schedule revisions. All the daily handouts tike cue sheets and memos were returned to boxes and recycled (again). WE USED CRUELTY-FREE MAKEUP from Il Makiage, a company that makes natural commercial makeup. The results were very satisfactory. SOAPS: We had a lot of products donated, so we were able to transform all the bathroom and kitchen cleaning products into lowimpact products. We also made a gift of natural shampoos and toothpaste to each member of the crew, due to donations from these companies. Some seemed pleased with the products and interested in the concepts of cruelty-free and environmental products. Also, we used recycled toilet paper. A couple of boxes worked for the whole shoot. RECYCLING: We had two PAs in charge of recycling and they set up bins for different colored glass and metals and so on. There was a recycling plant in nearby Liberty, NY, and we did a drop off every few days. At first, there was more than the plant could accept. TRASH: We collected all trash, both in the office and on location in heavy duty paper bags. We kept the plastic, bag consumption at a minimum. CATERING: We started out with "hard dishes" for our lunch, which was served on location: A farmhouse, a field, and another farm were the locations the first week. We had production assistants washing the plates after each meal, using the Ecover brand washing soap. Of course, this didn't fit into their picture of the glamour of show biz, and they felt overworked. With one day's exception, it rained everyday the first week, and we were thrown behind schedule. The first thing to go was the hard plates. This was a great disappointment to me, and I asked that there be some effort to reinstate them once we got over the difficult period. Of course we never got over the difficult period. Once behind, you rarely catch up. We were forced to resort to paper plates. Recycled paper plates were hard to find at the time, and as we had not researched them well in advance, we used supermarket brand for the duration of the shoot. When we ate dinners at the inn, we offered a choice of paper plates or hard plates. If you used hard dishes you had to wash them yourself. There was probably a 30%-70% split in favor of paper plates. Some did make the effort. We stuck with real silverware throughout the shoot. I felt that we would lie giving in entirely if we opted for plastic, which was a consideration when several crew members got a stomach virus in the same week. The argument was that they were catching it from the flatware. I instructed them to wash the flatware more thoroughly. Everyone recovered from the No Telling epidemic and we stuck it out with the flatware. MUGS VS. CUPS: We gave everyone a No Telling mug, which we hoped would reduce the use of paper cups. The mugs were used, sometimes hoarded, sometimes broken. But they got a lot of use and made a dent in our consumption of paper cups. I think this experiment could be improved upon with more durable mugs. I recommend Hotjo. If they seem too expensive, get tile crew to put in five bucks for their own mugs. A small price to pay. Some of the grips already had their own plastic no-spill cups which they used throughout the shoot. There was no styrofoam at any lime, except when anyone got take-out from the local coffee shop. DIET: We hired a local couple and they prepared lunch and dinner for the duration of the four weeks. The vegetables were grown locally and fresh. Every meal had a vegetarian option and a meat or fish option. The food was so good that the occasions when there was no meat went unnoticed by the carnivores. Several crew members and cast members abstained from eating meats and chicken throughout the shoot in acknowledgement of the themes of the project. A couple of people stayed vegetarians to this day (including the film's mad scientist). CRAFT SERVICE: Breakfasts were prepared by a local man who made eggs on a roll. There was nothing alternative about the preparation, but the craft service table offered other options. The craft service table was a meeting of philosophies. There were a number of healthy options, including cereals, snacks and candies donated from organic distributors. At the same table were a number of traditional junk foods and American breakfast cereals. There was a battle of hearts and minds at this table, between quick-fix expectations, and health-conscious forces. BEVERAGES: There were similar discrepancies in the drinks. We tried to avoid the big name-brand sodas in favor of small company products. We had organic juices and seltzers. There were brand-name soda wars on set. There developed a hoarding tendency for Coca-Cola. Since many of us agreed we should try to avoid the big brand names, we didn't have Coke regularly on the set. As a result, we cherished it like a Third World country might. Absence made our hearts grow fonder of this ubiquitous product. BEER: We could not avoid major brand beers entirely, but were able to support the local beer, which was Genesee, and. we had the Mendocino Brewers in Massachusetts donate several cases of the natural ingredients beer Red Tail Ale. ANIMALS: We had a number of animals in the film: According to the original script there were to be mice, rabbits, raccoons, a deer, dog, calf, some cows, a finch,' and a frog. We hired an agency to supervise the animal handling, and in checking them out, we were basically satisfied that they had a very big sanctuary where many of their animals were free to roam. 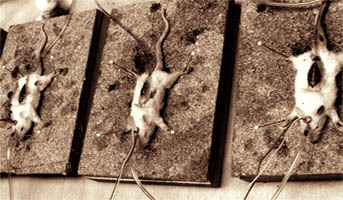 As the production wore on, I became aware of the difficulty of filming even the simplest scenes with animals. When filming a single shot sequence with a raccoon, I saw clearly how difficult it .is to film animals convincingly and humanely without: a great deal of special preparation. After that I opted to simplify the animal sequences and cancelled a shoot proposed with a deer. It became obvious to me that only domestic animals are going to be calm and responsive on a film set. We did shoot a scene with a very small angelic-looking calf that is disturbing on film. 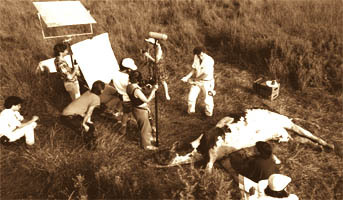 The calf appears exhausted and afraid: In fact the calf, who had grown weary of being pulled around, realized that if he fell over, he would be carried, This strategy on the calf’s part worked for the film, and we/were relieved when he got up after the shoot, full of energy and enthusiasm. A SCENE IN TOE MOVIE CALLED FOR A FIELD BEING BURNED. We burned about a half-acre of dry grass under the supervision of the fire department. We used gasoline and a bushel of hay to start the fire, hot without extensive debate about the environmental repercussions. Needless to say, only the environmentally conscientious were worried. We were told that the gas. Would burn off before seeping into the ground, and that field burning was routine. Because I wanted the shot, I believed the people who said it would be okay. The field burnt for about fifteen minutes one sundown, and in the final movie the shot lasts twenty seconds. We returned to the field two weeks later and it had all grown back; this I know. But there are always unseen effects of even this small an episode, and obviously, an unseen ecosystem was displaced because of our tiny epic shot. CLEANUP: Much of the set construction material was carted away in a dumpster, and more might have been salvaged with greater preparation. We donated a huge amount of supplies to Materials for the Arts in the city, though my favorite story is that the local farmers took our prop vegetable stand to sell their vegetables from. On the locations where we worked, we did a lot of grass replanting after the shoot, and up in the fields where a combination of the incessant rain and our heavy equipment had torn up some fields. Without exceptions, the locals had no complaints about the condition of the locations after we left. THE CREW WAS BASICALLY RESPONSIVE to the environmental concerns of the producers. A lot of them seemed to feel it was a valuable experience and some of the effort gave the filming process an added dimension and a sense of purpose. I think a lot of people found the ideas worthwhile, though as with anything that is branded "politically correct," there was a need to make fun of the whole thing, like kids poking fun at their teachers. I think the experience of making our film provides an apt metaphor for the way in which change in society is and is not brought about. A certain resistance that the crew had was due, surely, to an inability to understand the over-all implications of the environmental movement. It is a mistake of the movement to rely only on just listing the things that will change the world; it is essential that environmentalism be put in a world view context, as I have tried to do briefly in this book's forward. Otherwise, the movement is a series of fractured chores, inconveniences, and expenses that hardly seem worth it. To paraphrase John Lennon: "Tell someone and they will forget; show someone and they will remember; involve them and they will understand." In making No Telling we were not able to do many of the things presented in this guide, or to address all of the questions raised by it. But for the most part, these considerations were always in mind throughout the filmmaking process. There have in, fact been a number of advances in public awareness on these issues even since 1990 when we made the film: Copy shops are more likely to deal with recycled paper brands now; recycled products are increasingly available in, office supply stores; some major cosmetic companies have stopped or promised to stop testing on animals, and environmentalism is on everyone's agenda. But we must be cautious of superficial advances in the environmental movement, for as our government has proved over and over, there are apparent advances' (and promises), and there are real ones. As we have said already, the environmental movement threatens to topple a number of long standing institutions that will not lay down without a fight. I have spoken little about the content of films in this book. That's because my concern here is to draw attention to some of the nuts and bolts of film' production, and suggest there can be a little reform there. As for the bigger picture, I do believe that there are films that are worth making and seeing, and those that are not. Hollywood today has become an active proponent of the world paradigm that places economic value over everything else, and so it is that mainstream movies have lost their power to inspire, and merely struggle to satisfy the lowest common denominator in all of us. Meanwhile, the independents have embraced the verite style and content or T.V. tabloid shows, and are giving us violence as truth. Such is the state, of American cinema in the 1990's.